Hey everyone, this post was meant to go up months ago at the beginning of February but feel by the wayside. I can safely say the recipe has held it’s own and it definitely worth trying out. This recipe picks up where my post on cannabis infused coconut oil left off. Hope you like it! For this recipe I will be discussing more creative types of edibles that cannabis patients can make that are much healthier than your run of the mill pot brownies. As an advocate of cannabis as a medicine I feel medicine should be healthy and not contribute to obesity and diabetes like many sugar/butter loaded edibles do. Some people, like those with a wasting syndrome, need all the calories they can get and high fat/sugar edibles may be advisable, but they’re still better off with nutrient rich food rather than nutrient devoid brownies. This recipe is a wonderful one for medical cannabis patients like myself because curry sauce is pretty much all fats and oils which can all be infused with cannabinoids. The coconut oil is also healthy saturated fat which may contribute to weight loss and has other benefits. While I have made numerous curries over my past year of branching into this area of cooking this is the first batch I have ever made medicated with cannabis. 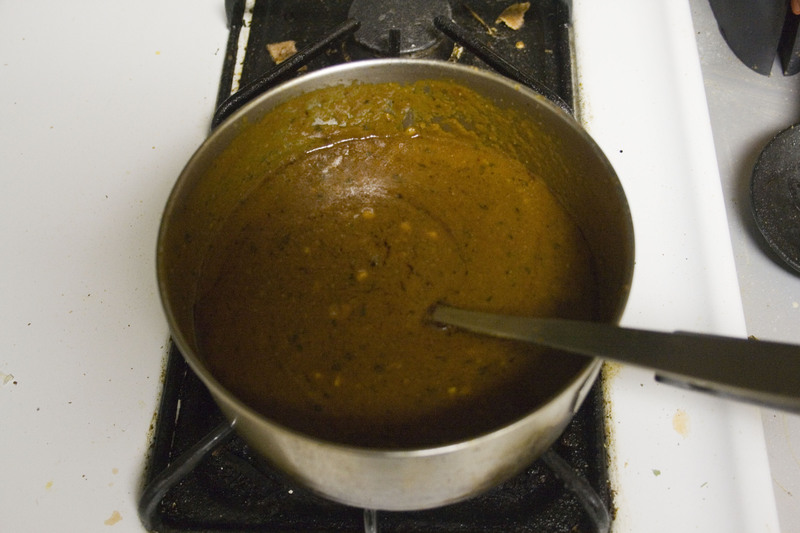 The curry flavor is also a wonderful way to mask the robust flavor of cannabis. I was splicing together the bits I liked of these recipes and tweaking it to my own tastes. I’m using the general basic recipe I improvise off (a thai curry with coconut) and adding some optional peanut for more flavor. I make my curries sweet because I have a low tolerance for spicy food but love lots of good rich spiciness in my food. Remember, you can always make a sauce spicier but it is infinitely harder to make it less spicey. If you over spice something your options are add more coconut milk, add more salt, or add more sugar, all of which run the risk of ruining your overall spice balance. I advise to err on the side of sweeter rather than going bold and risking a ruined batch. I am making this batch to jar and save so I am not adding any fresh cilantro or basil to it, as I would when serving it fresh. I will just be adding dried spices for now, but normally there would be some fresh spices going on. This batch turned out amazing and I would highly recommend this recipe to anyone who enjoys cannabis edibles but cannot stand the taste. 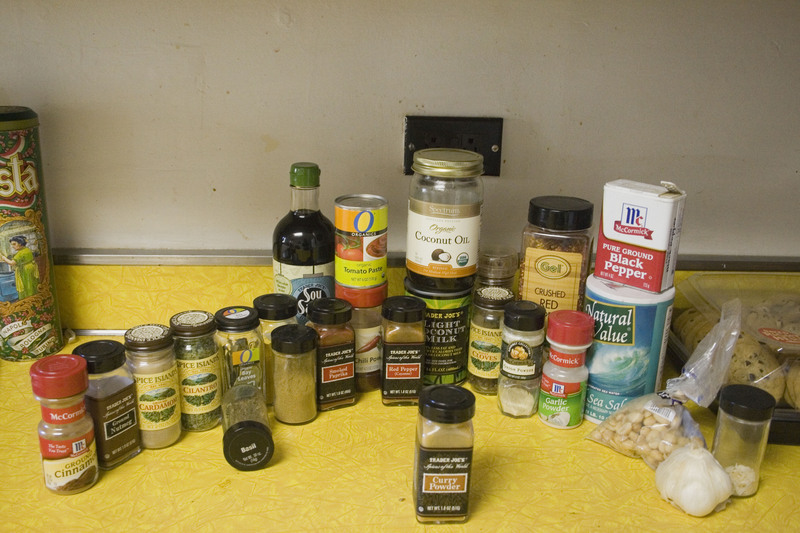 Step One – Spices: Curry sauce is an assortment of the right curry spices in the proper proportions. While there is a curry tree whose leaves are commonly used in South Indian and Sri Lankan curries, curry does not need to include it and most do not. I make my curries sweeter with coconut milk, soy sauce, and less cayenne pepper, more like a Thai curry than an Indian curry. I advise premixing your spices, making a curry powder, then you can add it all at once to your coconut milk, medicated coconut oil, and for the curry I am making tomato sauce. Step 2 – Prepare Your Fresh Veggies: For me this is just garlic, as I am not adding any cilantro or basil until later. To mince garlic first you must get it out of its shell and the easiest way to do that is to crush it under a large chef’s knife, as depicted. This will crack it open and often smash it down beginning the work of mincing. If it has sprouted a green leafy core just remove that and use the rest, this doesn’t mean the garlic has gone bad but it does mean you can plant it and grow a garlic plant. My last prep work consists of crushing peanuts to throw into the mix. I don’t have a mortar and pestle, instead I used the freshly washed bottom of a glass spice jar and a pyrex dish. It worked like a charm. This is more or less what your finished curry should look like. Color and consistency depend largely on what ingredients you use. Let me stress again that there are few wrong choices with curry as it tends to vary dramatically from region to region. If something doesn’t work for you try a new blend of spices or start from a store-bought curry powder and add more spices to the mix to make it yours.